Home Biafra Top News CONTINUED DETENTION OF KANU - THE WAR MIGHT START FROM THE BARRACK - TOP MILITARY OFFICER. 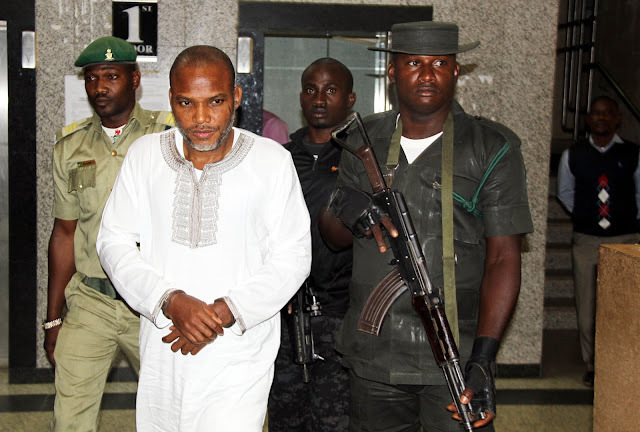 CONTINUED DETENTION OF KANU - THE WAR MIGHT START FROM THE BARRACK - TOP MILITARY OFFICER. With the continued detention of Nnamdi Kanu, the tide is slowly changing because patience is fading away. The survey conducted by Biafra Reporters through Ifeanyi Chijioke accurately shows that in Nigeria there is gross sense of division and in Biafra there is ill-feeling because people of Biafra feel with the continued detention of Nnamdi Kanu, they are treated as nobody despite the calls they have made even to the point of giving their lives away. The continued massacre of unarmed Biafra agitators seems to have been the major factor driving the impending dooms. While the continued detention of Nnamdi Kanu could be a spark plug and time is becoming detrimental. When Nnamdi Kanu was initially arrested; there was opposing views, some persons in Biafra seem to support the arrest while others were against it. The cultural group Ohaneze Ndi Igbo was at the centre of controversies while some leaders in Biafra were also not positive but with his continued detention, everything is quickly changing. Ohaneze are today shouting that things will get out of hand if his detention is not called off. Leaders are now talking that their son should be released and everybody seems to have come together and now speaking with one voice. There is a sudden change due to sympathy and conscience; there is an awakening for Nnamdi Kanu due to his continued detention. From militants to common or law-abiding men; military to civilians and political leaders to tribal leaders, everybody is responding to his continued detention. The officer posited. The top military officer who spoke to Ifeanyi Chijioke on the condition of anonymity has expressed his fears over what he termed ‘Biafra sentiment in the barracks’. The sentiment which started as a result of continued detention of Nnamdi Kanu seems to be significant in army barracks and should this get out of hand, there would be a military revolution that would not only divide Nigeria but destroy lives. The survey which shows that Nigeria has already been divide with 100% Biafrans and 60% liberals siding Nnamdi Kanu in what could as well be as a result of his continued detention while 80% Northern people and 40% liberals backed Buhari. The survey could not be successful in the Barracks as there was fear and issue of trust to have soldiers speak on Biafra. They were majorly of the belief that talking to journalists could be self destructive. According to the top military officer who confided in Ifeanyi Chijioke, he is very much certain that if Nnamdi Kanu’s continued detention is not called off; the military commanders could lose control of the boys. He noted that the continued detention of Kanu is whipping up unnecessary sentiment though he said soldiers are very careful with the sentiment. He noted that there is now a feeling in the barrack that the Northern soldiers are the big boys in the barrack while the Eastern and Western soldiers are less effective. He also said that the division is now everywhere and the everyday issue of Kanu’s detention is becoming a negative factor. “The spark plug, Nnamdi Kanu is the spark plug and we have to remove him to save the day” he quoted and continued. If Nnamdi Kanu is released; he can keep talking about Biafra but there won’t be any reason to feel bad or anything that would activate sense of division. Nnamdi Kanu can be released, he can continue talking about Biafra while the President keeps delaying referendum or opposing that in a civil way. With this there won’t be sympathy for anyone, there won’t be ill feeling and the game would be fair. Nnamdi Kanu is asking for Biafra but the President doesn’t seem to buy that idea; that will be the state if Kanu is released or was not arrested at all. He was of the view that the military might not be able to handle the development if not handled carefully and sympathy drawn to the side of the military. He further warned of possible coup and he said this is something that cannot be avoided if Kanu’s detention is not handled carefully. “Look, there would be bloodshed and the military to fight itself is something unimaginable; we might be taking this as a joke but the boys are careful, everybody is conscious and their eyes wide open. The division is very clear and even going to assignment is something very complicated, you send the boys to a mission and you see a group complaining that they won’t go with Emeka because Emeka won’t stop his people but would rather sell us out. When you send Emeka to Northern region, he says no I need Okechukwu to go the mission; Muhammad would sell me out to Boko haram. It is not like this before but since the arrest and continued detention of Nnamdi Kanu, we are losing the touch, sympathy is growing and the people are becoming religious and tribally conscious” he explained. There was a report in 82division Enugu where a soldier was said to have shot his commander for assigning only Eastern region personnel to fight against militants. The report which was sufficiently concealed and swept under the carpet to avoid heating up the polity or tension is one of the examples of this report. The top military officer has something to say. There is no unity in the barracks right now, we have liberal soldiers from West and we also have few liberals from Northern minorities but mostly Christians from Nasarawa etc. The liberals are of the view that Nnamdi Kanu has done nothing and neither has Biafran people taken up arms. They are more the elite soldiers who feel there should be civil approach than military approach to a people that don’t bear arms. When Nnamdi Kanu was arrested at first; they were very pleased with that with hope that he would be handled like Uwazurike but the opposite is now the case. The young man is resolute and having killed unarmed agitators and they are not backing down, sympathy began to grow for Kanu. The boys are beginning to pity Kanu as someone that is unfairly treated because he is from Eastern region or because he is Jonathan’s brother. They feel that after treating Jonathan the way he was treated, his brother is now being treated same way and it is not good news” he said. “It becomes hard for the soldiers to fight without having support, this is a one sided fight, the boys have gun against Kanu while Kanu have no gun. He is just talking and the boys are killing them just like that. There is sympathy for Kanu and this is as a result of his continued detention and his willingness to peacefully go about his cause in the first place. I receive calls from outside Nigeria and people tell me to talk to Buhari but that is not the order. People have interest in coup and the coup rumour you heard before is not a joke, people are serious and that is as a result of continued detention of Nnamdi Kanu. Kanu has won all the sympathy and you think the sympathy did not go beyond the barrack and Nigeria? Nobody wants Nigeria to divide and we shall fight for the unity of Nigeria if need arises; but the way Nnamdi Kanu is being handled, the fight for the unity might be done by only the Northern soldiers. The West might fight but not as much as those that won’t fight and those of them will be fighting alongside Nnamdi Kanu” he posited.